Creating hand-drawn features is a dying art if not a dead one. Computers have taken over the world of animation. One look at the offerings on the big and small screen alike serve to support those statements. For all of the studios and animators who rely far too much on computer generated animation, there are still some holdouts, rare as they are, who work to continue the tradition of using their own hands to create instead of computers. One of those holdouts is the famed animator Hayao Miyazaki. Miyazaki has created a number of hand-drawn features that have gone on to become some of the most well-known and beloved works in the world of anime. Those features include, but are not limited to Spirited Away, Kiki’s Delivery Service and Howl’s Moving Castle. In 2015, the famed animator officially announced his retirement. However, that retirement was short-lived, as the new documentary Never-Ending Man: Hayao Miyazaki points out. Set for release April 30, this new look into the mind of a man who is among the last of a dying breed, follows Miyazaki as he works to create a new CGI animated short, which leads to a surprise finale that (not to give away too much) will make the most devoted anime fans squeal with joy. That story of Miyazaki’s struggle with himself and with his team of animators is certain to keep audiences engaged. It will be discussed at more length shortly. The bonus material featured with the documentary is both a boon and burden to the whole of the doc. The feature’s average price point rounds out the most important of its elements, and will also be discussed later. Each item is important in its own way to the whole of the documentary. All things considered, they make Never-Ending Man: Hayao Miyazaki a surprisingly engaging presentation not just for anime fans but for fans of the animation realm in general. While some of Miyazaki’s thoughts are at times overly dramatic, his dedication to creating animation by hand is welcoming. That is especially the case as a group of individuals proposes to him, the use of artificial intelligence, to create his animated short. What the group presents upsets him greatly, and he does not mince words about his thoughts on what he sees, either. On a similar note, his comments about pushing the group of animators who are working on his short because of his desire for them to make the short perfect shows once more, that dedication to his craft. It really serves to humanize Miyazaki even more, while also reminding audiences that while hand drawn animation may be a dying art, it is not yet dead. It gives hope that one day animators will return to that style. The collective of Miyazaki’s story and the virtual love letter to hand drawn animation that is featured here gives viewers plenty to appreciate in this presentation. Of course it is just one of the elements featured in the presentation. The bonus abridged, English-dubbed version of the story is both a pro and a con that cannot be ignored. 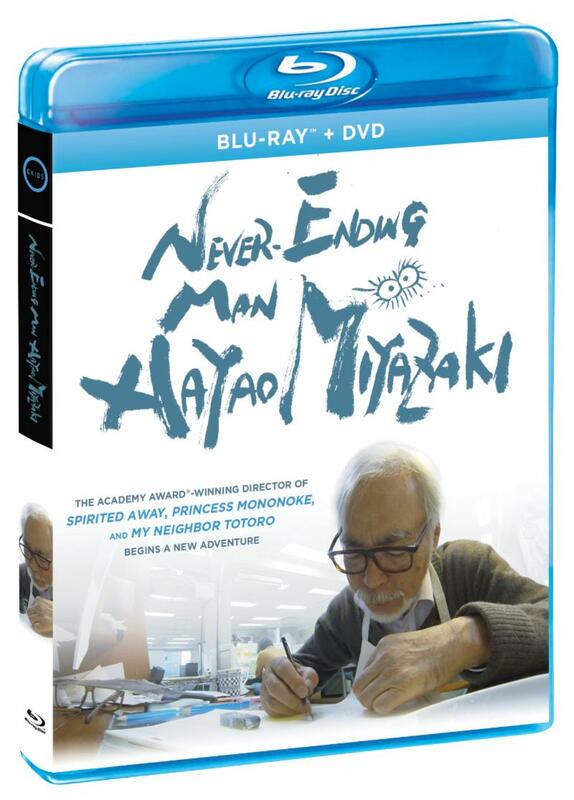 The English-dubbed version of Never-Ending Man: Hayao Miyazaki has to be addressed in part because on one hand, it is an English-dubbed take on the doc. That means no reason to be focused on the subtitles the whole time instead of actually watching the feature. To a point, that can be considered a good thing. That is because having that added focus serves to ensure even more, viewers’ engagement. On the other hand, one cannot help but wonder why the English-dubbed version of the documentary is shorter than the original 70-minute Japanese version of the program. One could argue that cutting the run time by more than 20 minutes for English-speaking audiences is a punishment of sorts to said viewers. Why not just make a full-length English-dub? Keeping that in mind, one cannot help but wonder if the English-language dubbed take on the movie is really such a bonus. Sure, it’s English-dubbed, but it is also shorter than the Japanese original. What’s more it is not the difficult to focus on the subtitles and the footage in the Japanese take of the program. Keeping all of this in mind, this documentary could have done gone just as well without the shortened English-language as with it. A better bonus would have been the footage not used in the final cut of the documentary. At least that would have created a fuller picture for audiences. That is because the noted footage serves in its own way to show why it was deleted. In turn it lets viewers create their own discussion whether they think it should have been cut from the final product. Again, it makes the shortened English-dubbed take of the program less of a bonus than perhaps it was intended to be. Luckily, even though the program’s bonus content is a bit of a misstep, it is not so much of a misstep that it makes the program unwatchable. Rather, it is a minor disservice to the program’s presentation. The presentation’s primary content more than makes up for that issue, and is worth the relatively affordable average price point. The average price point of this documentary, using price listings at Shout! Factory’s store, Walmart, Amazon, Barnes & Noble Booksellers and Books-A-Million, is $23.16. The least expensive of those listings is, fittingly, Shout! Factory’s listing, at $18.97. All of the other listings easily top the $20 mark. Considering that the doc is presented here on DVD and Blu-ray, paying $18.97 plus shipping and handling may push the price above the $20 mark, but still results in a price that is still quite affordable. What’s more it is money well-spent for a documentary that anime and animation fans are certain to watch more than once. That relatively affordable price, coupled with the strength of the documentary’s main feature makes Never-Ending Man: Hayao Miyazaki a positive offering from GKids and Shout! Factory that is certain to engage a wide range of viewers. Cohen Media Group will release two of Buster Keaton’s classic pictures next month. 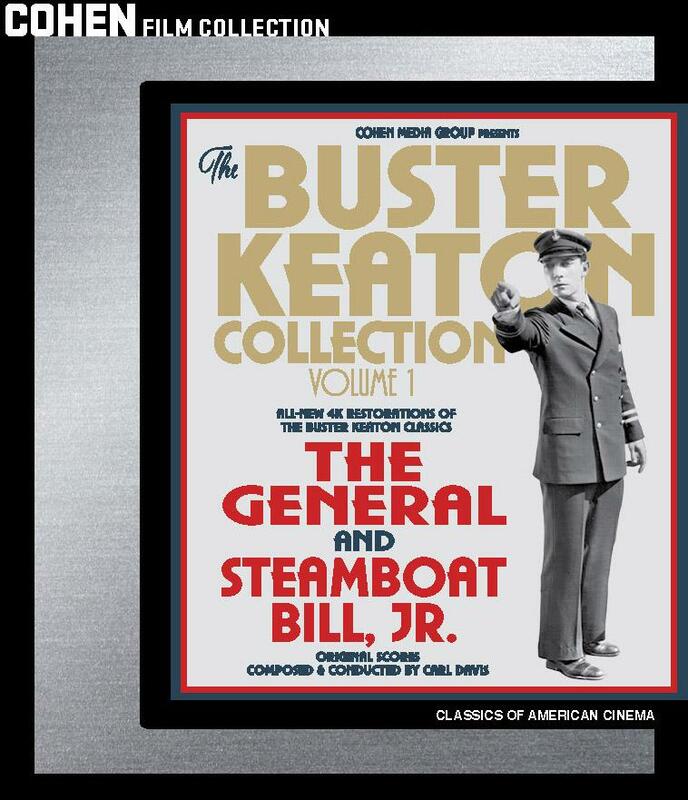 The General and Steamboat Bill Jr. are set for release on DVD and Blu-ray on May 14 in what is being titled The Buster Keaton Collection: Volume 1. Both movies are considered some of Keaton’s best works, and are even featured in the National Film Registry. The General (1926) is considered by many critics to be the last truly standout movie of the silent era. It is listed at No. 18 on the American Film Institute’s 100 Greatest American Films and at No. 34 on the latest Sight & Sound critics poll of the movie industry’s greatest movies. The civil war movie features Keaton as train engineer Johnnie Gray. Gray’s train is taken by Union spies, leading him on a chase to reclaim the locomotive. Steamboat Bill Jr. (1928) stars Keaton as the son of a steamboat captain. Keaton’s character rescues a young woman following a cyclone, to prove his love for her, and later has to face her father man to man to show even more how much he loves the young woman. Along with the two main features, The Buster Keaton Collection: Vol. 1 will also feature the bonus featurettes “Reflections on The General” and “Buster Keaton: The Luminary. Buster Keaton is a legend among icons in the entertainment industry. His work early in his life on the Vaudeville circuit, along with his work in movies and television has gone on to be an unrivaled model for so many of today’s entertainers. Late last year, independent movie studio Cohen Media Group paid tribute to Keaton and his timeless work with the debut of a new documentary titled The Great Buster. The movie made its theatrical debut on October 5. Early this month, Cohen Media Group released the doc on Blu-ray. It goes without saying that the feature is a fitting tribute for Keaton. That is at least in terms of its primary content. Where the doc’s main content is an engaging and entertaining presentation, its bonus content is somewhat problematic. It will be addressed a little bit later. The single-disc presentation’s price point makes the item overall worth spending, especially for the most devoted cinephiles. Each item noted here is important in its own way to the whole of The Great Buster. All things considered, they make The Great Buster maybe not great, but still a very good offering for its noted target audiences. Cohen Media Group’s new Buster Keaton profile The Great Buster is a fitting tribute for the legendary entertainer. That is proven in large part through the documentary’s main feature, which outlines, in depth, Keaton’s career from his early days on stage with his parents in the Vaudeville circuit to his meteoric rise to fame in the cinematic world to his downfall and eventual resurrection (of sorts) following the noted decline. The story is told through the words of the doc’s narrator/director Peter Bogadnovich, anecdotes and thoughts from Keaton’s contemporaries and those who have called Keaton an influence in their own rise to fame. They include, but are not limited to Mel Brooks, Bill Hader, Ben Manckiewicz, Johnny Knoxville and Richard Lewis. Knoxville talks in his interviews about the role that Keaton’s physical comedy played in the stunts performed on his famed MTV series Jackass while Hader discusses Keaton’s on-screen demeanor and how that played into his own performances. Brooks offers his own praise for Keaton, going so far as to call Keaton a comic genius. The celeb showcase featured in The Great Buster is a good addition to the doc’s presentation, and certainly is not the only important part of the story of Keaton’s life and career. Audiences will be surprised to learn of the struggle that Keaton faced during his years at Metro-Goldwyn-Mayer (MGM). As Bogdanovich notes in his narration, Keaton lost all creative control when he signed on to work for MGM. The result was a series of movies that ultimately flopped at the box office. Bogdanovich discusses this a little more in depth in the doc’s bonus content, which will be addressed a little bit later on. This is just one of the interesting items revealed in the rather fast-paced bio of Keaton. The most devoted cinephiles will be just as interested to learn that Keaton allegedly did not stop a biopic of him from being made later in his life. That was because the money that Keaton received paid for the home in which Keaton would live through the rest of his life. Interestingly enough, it is revealed that the biopic – like so many of the biopics that Hollywood continues to churn out today – was anything but factual. It’s more proof that audiences should not watch biopics, but rather learn about their favorite figures through presentations such as The Great Buster. As if all that has been noted already is not enough, viewers also learn through this presentation that Keaton suffered multiple broken bones throughout his career – much like Johnny Knoxville – and that Keaton’s bits were even a central influence for much of what is seen in Warner Brothers’ equally timeless Looney Tunes shorts. Watching the clips that are incorporated into the doc to help tell Keaton’s story, it is easy to see the similarities between Keaton’s work and so many Looney Tunes shorts. The note that Keaton was honored late in life, not long before his death showed that while his star might have faded over the course of his career, it never fully burned out. It’s just one more of so many elements that makes the main feature of The Great Buster fully engaging and entertaining. Of course, as engaging and entertaining as the program’s main feature is, the bonus content that accompanies that content detracts from the doc’s presentation a little bit. The bonus conversation with Peter Bogdanovich is slightly problematic because while it does add a little bit of extra to the doc’s foundation, it only adds a little bit at best. Bogdanovich notes in his discussion, that MGM admittedly did not know what to do with Keaton once he had been signed. That might account for why he was so unhappy making his movies with the studio, and why the end product allegedly did not do so well. Bogdanovich also notes during his discussion why he decided to close out the profile with a focus on Keaton’s early works instead of the standard format of ending with Keaton’s passing. That in itself is an interesting discussion, considering that he did not follow the standard bio format that so many outlets use for their profiles. Other than these notes, not much else is added to the main story. Making things a little bit more problematic is the audio mix on the presentation. The discussion takes place in a live setting, complete with moderator and audience. Because the audience members who ask questions don’t get to use a mic, they are not heard, even as the person behind the boards pumps up the volume. All that is heard as they ask their questions, is a very loud, unbearable buzzing sound. Making matters worse, so much of Bogdanovich’s discussion is difficult to hear in itself because he seems to be holding his microphone right against his mouth throughout the discussion. The result of that is a very garbled delivery that takes a few listens each time in order to at least mostly decipher. Overall, the presentation here detracts quite noticeably from the overall presentation of The Great Buster. Perhaps the only positive to the whole thing is the revelation by Cohen’s head, that the company has obtained the rights to many of Keaton’s shorts from the 20s. It leaves movie buffs hoping that sooner rather than later, they will see those timeless shorts released for enjoyment once again. Keeping all of this in mind, the bonus content that accompanies the main presentation of The Great Buster honestly does not do much to help the overall presentation. It doesn’t necessarily make the program unwatchable either. To that end, the collective primary and secondary content presented in this doc makes it maybe not great overall, but still good. 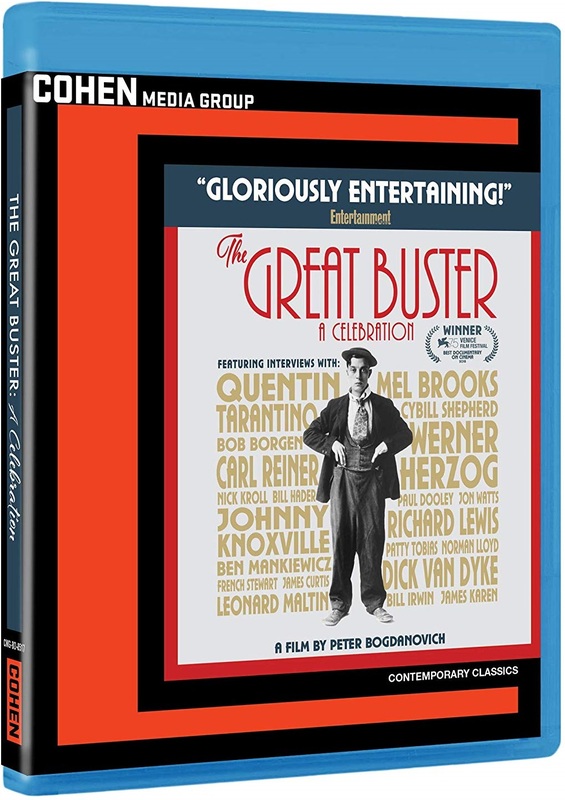 The collective primary and secondary content presented in The Great Buster makes the doc worth the addition to any cinephile’s home library for an occasional watch. The doc’s price point strengthens that statement even more. At the time of this review’s posting, its physical presentation is listed only at Amazon, with its Blu-ray price listed at $24.99 and its DVD price listed at $25.99. A check of Walmart, Best Buy, Target, Amazon, Barnes & Noble Booksellers and Books-A-Million showed no listing for the doc in physical form. Walmart and Amazon both list it digitally. Walmart’s digital listing is $12.99, the same as Amazon’s digital price. Regardless of which platform viewers choose, neither price is a budget buster. Given, the physical price maybe should be less expensive considering the good and bad noted of the primary and secondary content. That aside, both prices are money well-spent, again, for any devoted movie buff. Keeping this in mind, it is one more way in which this doc proves to be maybe not great, but still good. Shout! Factory has a new French import on the way. 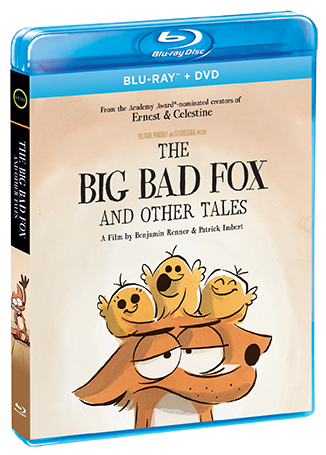 The Big Bad Fox & Other Tales is set for release on Blu-ray/DVD combo pack on July 16. The animated feature, from GKids, first premiered in France in 2017. It follows a a fox who cares for a family of baby chickens, a rabbit who plays stork and a duck who wants to be Santa Claus. Co-directed by Benjamin Renner and Patrick Imbert, the 81-minute feature is an animated adaptation of Renner’s own famed graphic novel that throws back to the golden age of animation, presenting stylistic similarities to classic Looney Tunes shorts. The slapstick presentations overlay deeper messages about family and the challenges of everyday life that will appeal to parents and older children. A trailer for the feature is streaming online now here. As an added bonus, Shout! Factory’s upcoming home release of The Big Bad Fox and Other Tales will also feature additional content, such as and interview with Rnner and Imbert, a “making of” featurette and Q&A session at the New York International Children’s Film Festival. The feature’s upcoming domestic release will also feature English and French tracks. The English-dubbed tracks feature the voices of British celebrities, such as Bill Bailey, Justin Edwards and Matthew Goode. Frank Sinatra fans are going to get a new documentary on the famed singer this summer. 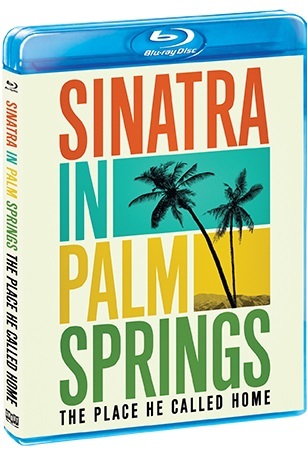 Zahn’s new doc tells the story of Sinatra at his California sanctuary through interviews with figures, such as Tom Dreesen, Barbara Sinatra and Michael Fletcher. Pre-orders for the program are open now. Universal Pictures’ classic 1950s creature features are among some of the greatest cinematic works in Hollywood’s rich history. During their original theatrical runs, they were considered scary. By today’s standards, they are anything but. That’s okay though. That is because they are examples of moviemakers doing so much more with so much less. They are examples of movie making done right, and later this month, Shout! Factory and its horror arm Scream Factory will resurrect yet another of the studio’s classic creature features in the form of the 1995 classic Tarantula. The latest of the studio’s movies to be re-issued by Shout! Factory, it is set for re-issue on Blu-ray on April 30. It is another great addition to any true movie’s buff’s collection. This is proven in part through the movie’s story, which will be discussed shortly. The bonus content featured in the movie’s forthcoming re-issue supports that statement even more, and will be addressed a little bit later. The movie’s average price point proves to be money well-spent considering the re-issue’s combined primary and secondary content. When it is considered with those noted elements, all three elements make the movie yet another of this year’s top new DVD and BD re-issues. Shout! Factory/Scream Factory’s upcoming Blu-ray re-issue of Universal Pictures’ 1955 creature feature is a must have for any true movie buff. It is one more of this year’s top new DVD and BD re-issues. That is thanks in part to the movie’s story. The story at the center of Tarantula actually somewhat defies the movie’s title. As a close watch will reveal, the real core of the movie was Professor Deemer’s misguided efforts to create a solution that will create super-sized animals and other foods to feed the world’s exploding population. The result of Deemer’s tests are shown right in the story’s opening scene. Of course, this is not fully realized until later in the story. It would be wrong to call Deemer a mad scientist, but he is clearly misguided, as he wants to keep the findings and results of his work secret. It is because of those efforts to hide what he is doing that the story’s titular character escapes from its enclosure in his home laboratory and wreaks havoc on a nearby town. The majority of the story is spent with lead character Dr. Matt Hastings (John Agar – The Mole People, The Brain From Planet Arous, Night Breed) investigating a series of deaths around the unnamed town that slowly leads him to the killer spider. During the course of that investigation, the spider is rarely shown. When it is shown, it is barely presented. This is both good and bad. It is good in that it builds the suspense in the story. The bad side is that the buildup leads to some noticeable pacing problems. The pacing problems are not so bad that they make the movie unwatchable, but are problematic enough that they lead one to get the urge to fast forward every now and then. Luckily, the story does eventually find its footing, and when it does so, finally starts moving forward much more easily. One can’t help but wonder if this approach played a role in how famed author Peter Benchley approached his book Jaws when he wrote that novel. Its big screen adaptation followed a similar approach, not really fully introducing the movie’s killer title creature until late in the movie. Getting back on the subject at hand, once the story finally finds its footing, it does well keeping the action moving, and in turn keeping viewers engaged and entertained. The ending seems a bit abrupt, but still works, regardless. Keeping this in mind along with the entertainment offered throughout the rest of the story, there is no question that the script, despite some minor bumps, is still an enjoyable work that will gives audiences plenty to appreciate. The enjoyment created by the movie’s story is enhanced even more by the movie’s bonus feature-length audio commentary. The commentary, presented once again by film historians Tom Weaver and David Schecter, adds its own share of enjoyment to the movie. The pair has previously provided commentary for Shout! Factory/Scream Factory’s Blu-ray re-issues of The Deadly Mantis and The Mole People. Weaver also previously provided commentary for The Man From Planet X with Dr. Robert J. Kiss, who joins Weaver and Schecter for this outing. The trio’s commentary offers lots of insight about the movie’s casting, its connection to other sci-fi and horror flicks of the time and trivia directly connected to the movie. One of the most interesting revelations presented in the audio commentary comes from Schecter as he reveals that famed composer, conductor and musician Henry Mancini played a role in the movie’s soundtrack. It’s not the first time that Mancini’s role in the movie industry has been noted. Schecter reveals in the audio commentary for The Deadly Mantis, that Mancini played a key role in that movie’s soundtrack, too. Weaver, meanwhile reveals late in the commentary, that allegedly Agar was not entirely happy being cast just in the studio’s creature features, while his more well-known counterparts, such as Tony Curtis and others were receiving more high-profile roles. Weaver reveals in this anecdote, that Agar was so unhappy that he freelanced for other companies, but sadly was typecast because of his work with Universal. Kiss meanwhile, reveals that when Tarantula originally debuted in theaters, it actually ran as part of a double feature in many U.S. theaters alongside the cop action/drama Running Wild. The movie starred Mamie Van Doren (Teacher’s Pet, Voyage To The Planet of the Prehistoric Women, The Navy Vs. The Night Monsters) in one of its lead roles. The revelation that the movie did not run by itself in many theaters is important because it shows some theater owners might have thought at the time that it was not strong enough to run solo. As if everything noted here as to the movie’s commentary is not enough, there are also notes of possible link between Them! and Tarantula, between This Island Earth and Tarantula (the prior of which Shout! Factory/Scream Factory is set to re-issue on June 25 along with Monster on the Campus) and even info on at least one goof and some background on how the tarantulas used in the movie were chosen. Between all of this and so much more shared throughout the course of the movie’s audio commentary, the breadth and width of material shared throughout the movie is more than enough for audiences to take in. Given, it once again sounds and feels entirely scripted by all involved, which does detract from the presentation once more. However, the commentary’s clear scripting is not so bad that it makes the commentary a loss. It just would be nice to have commentary shared naturally rather than scripted. Either way, when the commentary couples with the movie’s story, the two elements go a long way toward making the movie enjoyable for all audiences. Keeping that in mind, the movie’s average price point proves to be money well-spent. Shout! Factory is bringing the Japanese coming-age-age story A Silent Voice to American audiences. Set for release on Tuesday on Blu-ray/DVD combo pack, the almost two-and-a-half-hour movie is a stirring tale of redemption that will engage and entertain anime fans just as much as it will those who might not typically be interested in the very niche genre. That is due in part to that story, which will be discussed shortly. While the story’s appeal is far-reaching, it does suffer from at least one problem in its pacing, which will be discussed a little later. The movie’s average price point plays its own important part to its presentation, and will also be addressed later. Each item noted here plays its own important part to the whole of A Silent Voice. All things considered, A Silent Voice is certain to generate plenty of discussion among audiences. Shout! Factory’s new anime import A Silent Voice is a cinematic offering that is certain to generate plenty of discussion among audiences. That includes the most devoted anime fans and even those who are generally not as interested in the very niche genre. That is due in part to the movie’s story, which follows a young high school student named Shoya Ishida as he tries to make amends for bullying a former classmate years earlier in their middle school. Shoya bullied the girl, Shoko Nishimiya, along with a group of his friends just because she is deaf. The end result is that Shoko’s mother ends up transferring her to another school, and Shoko ends up being ostracized by his own friends. The result of what happens to Shoya leads him to have a revelation that at first turns him suicidal. However, after his failed attempt to take his own life, he realizes that it is his mission to right the wrongs caused by him and his friends. The story does have a happy ending. As a matter of fact, one could almost make a biblical comparison of sorts to the story’s end and a certain story from the Bible interestingly enough. However, along the way, the story’s progression is so emotionally heavy that audiences will definitely have to be in a certain frame of mind in order to watch through the whole thing. That is not to say the story is unwatchable, but rather that it is simply that deep and heavy. Staying on that track, coming-of-age stories and tales of redemption are nothing new to the movie industry in the Western and Eastern hemispheres. However, the way in which the story’s writing team crafted those two interweaving story elements in this case is an intriguing new approach. That in itself makes the movie worth the watch. While the movie’s central story does plenty to keep viewers engaged and entertained, it does suffer from one problem – its pacing. The run time of A Silent Voice is two hours and 10 minutes. A lot of things happen over the course of that run time. There is also a lot of jumping around in terms of time frame from one scene to the next. There are points at which the story could have easily wrapped up, but instead, it keeps going. While these issues do not leave audiences checking their watches, it does create enough of a problem that viewers will recognize the noted issues and wonder when the nearly two-and-a-half-hour story will finally end. Luckily, as much of an issue as the pacing is for the overall presentation of A Silent Voice, it is not so overly prominent that it makes the movie unwatchable either. It is just another example of what often can and does happen when multiple people have their hands in the proverbial writing pot for any movie, whether Asian, American or from somewhere else. Keeping all of this in mind, A Silent Voice is still worth an occasional watch when audiences are in the right mindset, especially considering the movie’s average price point. 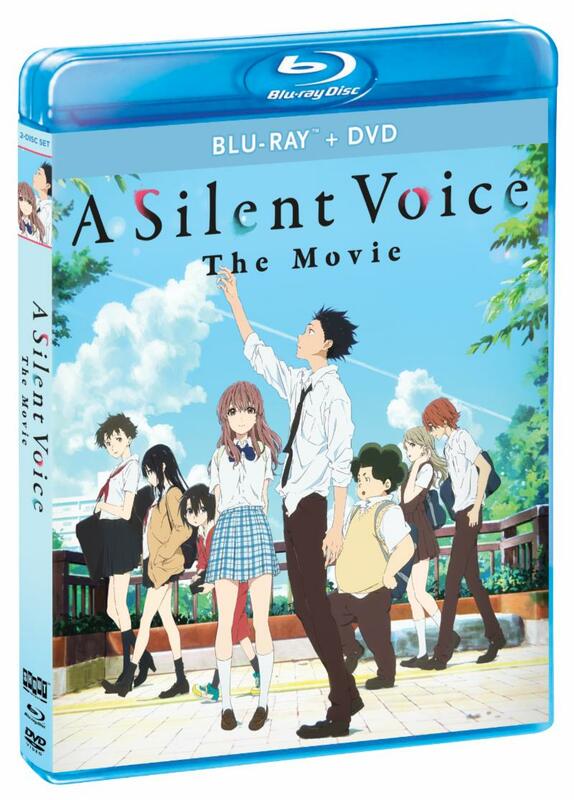 The average price point for the Blu-ray/DVD combo pack release of A Silent Voice is $20.69. The average price for its DVD standalone release is $12.48. Those prices were obtained using listings at Shout! Factory’s story and those of Best Buy, Target, Walmart, Amazon and Barnes & Noble Booksellers. The movie was not listed at Books-A-Million, but the book series on which the movie is based was listed there. Neither price is a bank buster, so to speak. What’s more, the story at the center of the movie actually stands out from so many anime movies. What’s more, while it is emotionally deep and heavy, it is still relatively accessible for its target audiences. That accessibility, coupled with the depth of the story, makes it a movie that is worth at least an occasional watch. That being the case, whether one buys the movie on DVD or on Blu-ray/DVD combo pack, the price paid is money well-spent. Keeping all of this in mind, A Silent Voice proves itself to be itself a worthwhile investment among drama fans and anime fans alike.